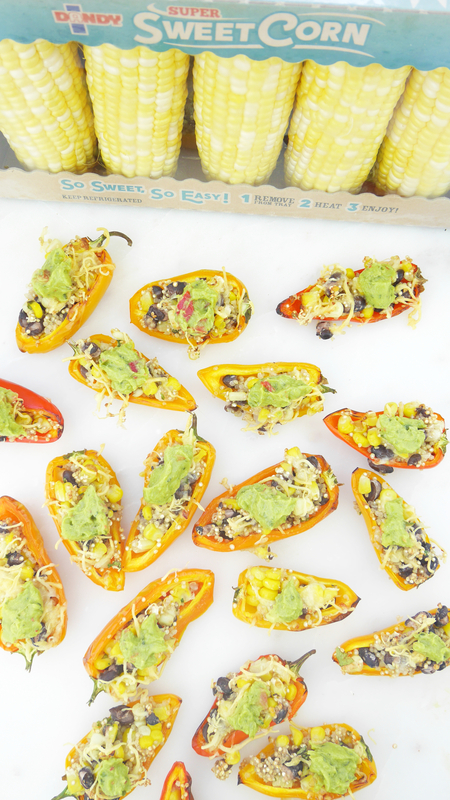 The PERFECT summer bite: bell pepper + corn + avocado! Happy June and happy national fresh fruit and veggie month! 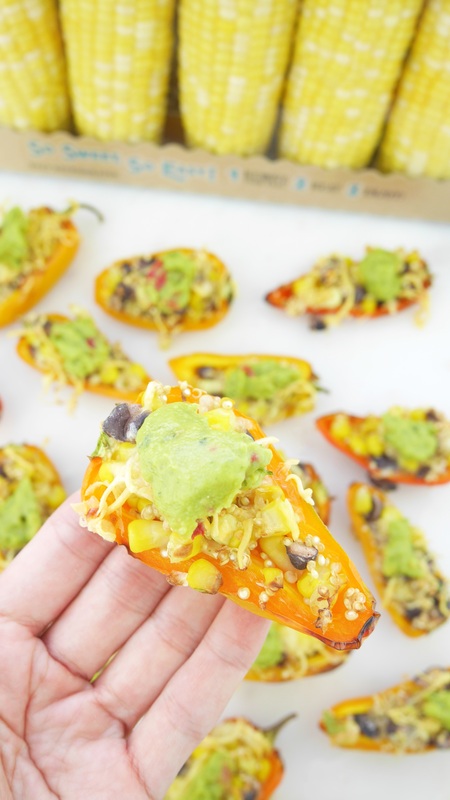 Today on Good Food Friday I shared some fun ways to incorporate more veggies this summer including these mini bell pepper corn poppers. These bite-sized snacks just scream summer and are a great way to get kid’s involved in the kitchen making their own food. They are colorful, nutritious and packed with fiber + protein (the Nutrition By Mia formula for a snack with staying power). Just a little bit of cheese and a dollop of guacamole makes these the tastiest summer snack. Serve them up as a colorful, seasonal app or whip up a batch for easy snacks and lunch on the go. These are made with Dandy’s Super Sweet Corn which is non-GMO and comes in a recyclable tray. Besides grilling, which is my favorite way to eat corn, it can simply be boiled and added to salads, custards, even ice cream! 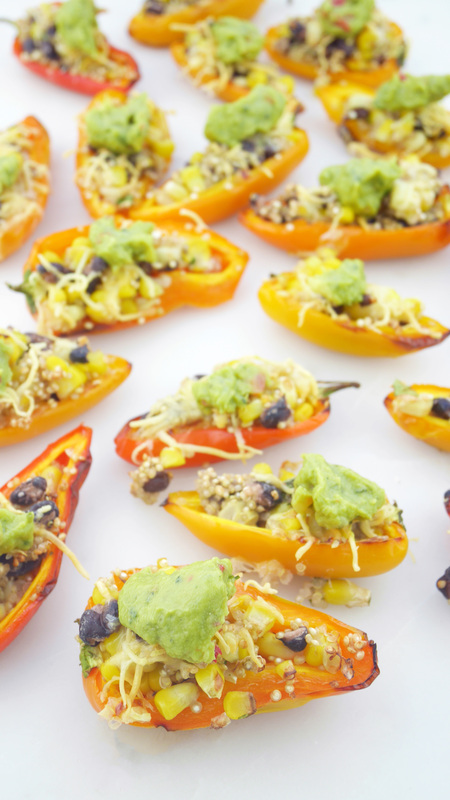 Black beans add protein and more fiber to these poppers while whole grain quinoa is a source of fiber and B vitamins. Catch more recipes and tips in today’s national fruit and veggie month segment on ABC Charleston’s Good Food Friday! Cut bell peppers in half lengthwise and remove seeds and membranes. In a large bowl, combine all ingredients except cheese and guacamole. Spoon filling to bell pepper halves. Top with cheese and bake for 15-20 minutes. 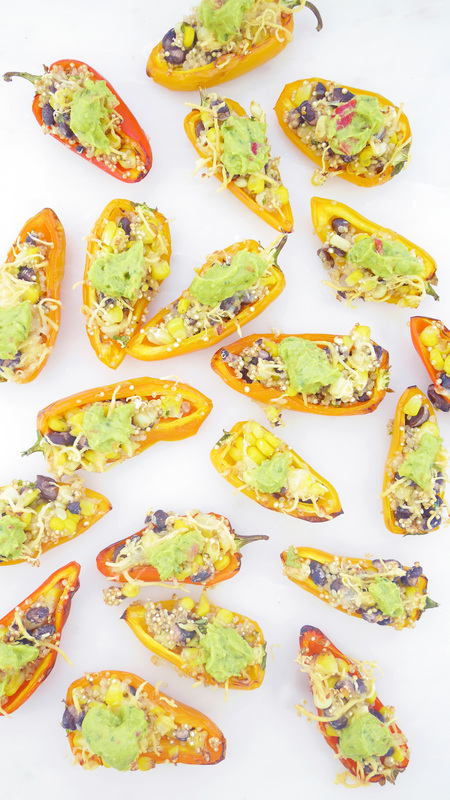 Remove from oven and serve each with a dollop of guacamole.